There is little to admire and less to imitate in the people who are prominent in our culture. We have celebrities but not saints. 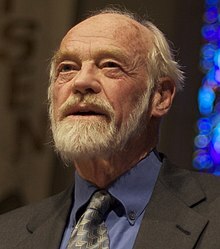 Eugene H. Peterson (November 6, 1932 – October 22, 2018) was an American-born clergyman, scholar, author, and poet. The puzzle is why so many people live so badly. Not so wickedly, but so inanely. Not so cruelly, but so stupidly. There is little to admire and less to imitate in the people who are prominent in our culture. We have celebrities but not saints. Famous entertainers amuse a nation of bored insomniacs. Infamous criminals act out the aggressions of timid conformists. Petulant and spoiled athletes play games vicariously for lazy and apathetic spectators. People, aimless and bored, amuse themselves with trivia and trash. Neither the adventure of goodness nor the pursuit of justice gets headlines. This page was last edited on 12 November 2018, at 01:02.